Requirements for the establishment of a new water system are described in R309-800-5. The information provided below should also be reviewed. Those creating a new public drinking water system must demonstrate that their water system will have sufficient financial, managerial and technical capacity. See Capacity Development (R309-800) for more information. Review Criteria for Establishing the Feasibility of Proposed Housing Subdivisions (July 1, 1991) and Other Similar Developments is intended for housing developers who want to create a new water system, or who wish to connect a proposed subdivision to an existing drinking water system. In these instances, Division staff may recommend that a feasibility review be done prior to the preparation of engineering plans and specifications. Furthermore, some local health departments and planning agencies specifically require a Utah DEQ feasibility review before platting proposed subdivisions. This document describes what information must be provided to DEQ prior to the issuance of a feasibility statement. There are likely other environmental concerns besides the construction of a new water supply. You may need to address, for instance, industrial waste disposal. ContactDEQ and request a Pre-design meeting. Consult this guide for a summary of permitting requirements for all Utah DEQ agencies. Engineering plans and specifications for all public drinking water projects must be approved by DDW prior to construction. Plans and specifications must be prepared by a Utah-licensed professional engineer. Facilities must be designed in accordance with Facility Design and Operation Rules see R309-500 through 550. For further information, see Construction Approval Process. Those wishing to create a new public drinking water system must pay particular attention to the rules governing the location, design, and construction of new drinking water sources (e.g., wells or springs). See General Requirements For Developing New Sources. Those planning a new public drinking water system should be fully aware of the requirements which they will be subject to. 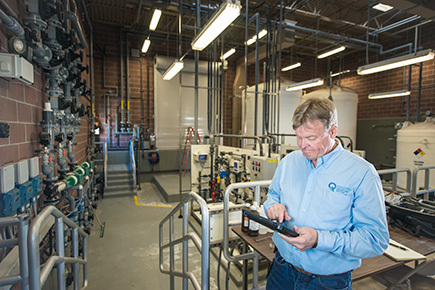 A summary of what water systems operators must address.